OK—this thing is a space monster. Apple just dropped a Next Gen MacBook Pro with the highest resolution screen in laptop history, and the thinness of the air. Retina Display spewin', HD chewin' supercomputer. This is Apple's crown jewel of computing. The Next Gen Pro is mind-boggling: a 2800 x 1800 resolution on a 15.4-inch screen—that's well over 5 million pixels, dwarfing your HDTV. That also means the computer qualifies as a retina display, with a pixel density of 220 PPI—seamless when you're staring at it from a normal computer distance. By comparison, the current 15-inch Pro drives a mere 1440×900. I guess that's puny as of today. But let's get beyond the display. This is an engineering marvel. The Next Gen is thinner than a finger, weighs 4.5 pounds, and sports Intel's fastest new Ivy Bridge processors—Quad-Core 2.7 GHz of processing (Turbo Boost-able up to 3.7 GHz) might in that teeny tiny frame. This thing will also be a gaming powerhouse by (laptop standards), packed with Nvidia's Kepler GeForce GT 650M. Want more? You can get a staggering 768 GB—yes, that number is correct—SSD drive. That's mammoth. More? Two Thunderbolt ports, HDMI, an SD card, USB 3.0, and "MagSafe 2." No ethernet port or optical drive, but it's time to shed some old tech—and that's a big part of what keeps this thing so svelte. DVDs are dead. Bye. This computer is essentially the pinnacle of Apple technology. Little flourishes like dual microphones and a custom-designed asymmetrical internal fan (for quiet cooling) abound. The best part? 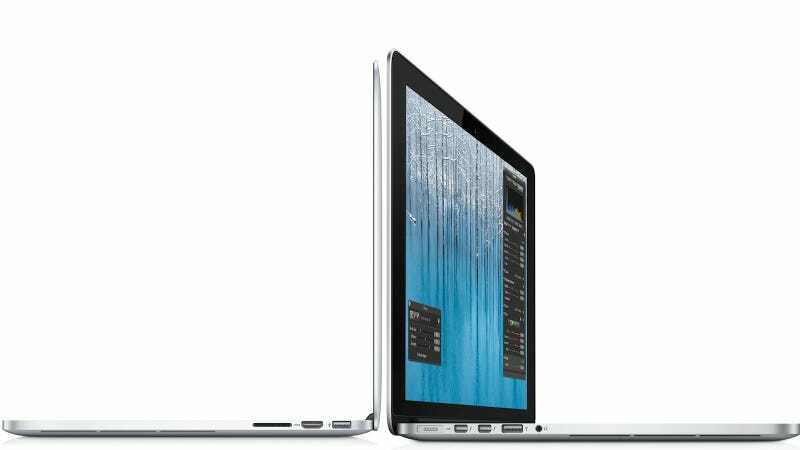 The "MacBook pro with Retina Display," the starship's official name, starts at $2200 with a 2.3 GHz Ivy Bridge processor, 8 GB of RAM, and a 256 SSD. Ships today. If you want to max it out—2.7 GHz processor, 16 GB of RAM, and the 768 GB SSD, it'll hit you $3750. Which is a lot, but, Christ. This is the computer we were all dreaming for today—the inevitable unification of the Air's impossible lines and the Pro's, well, professionalism. It's an aluminum synthesis that makes a power computer seem as gentle for us humans as it is astoundingly capable. And it's the most exciting thing Apple's done in years.